The Islamic State is one of the contemporary most serious and novel threats to the transitioning (or not) current world order. The fact that war is part and parcel of the Islamic State and its Caliphate or Khilafah (خلافة) very existence is only one of the many challenges and novelties that most of the rest of the world must face. The merging of different wars and issues is another mammoth challenge. For example, the wars in Libya, Syria and Iraq merged with the Islamic State war. When it became clear that a new war had started, one key question was to find out is there were different theatres of operations for a theatre of war itself limited to the Middle East and North African Region, or if we should revise the way we apply those strategic concepts, or if the very concept of the theatre of war, understood as an ideal-type of a defined quasi-independent system (Carl Von Clausewitz, On War, Book V, Ch 2) was also in needs of revision because of the Caliphate and its use of the globalised networked world into which we live. These questions are still crucial in May 2017, even though many seem to start believing – a bit early ? – that the war against the Islamic State has been won. As far as the theatres of operations are concerned, who are those who define them? If we use the American definition of “theatre” – “The geographical area for which a commander of a geographic combatant command has been assigned responsibility. (JP 1-02. SOURCE: JP 1)” – then, again, who defines the geographical area as well as determines when responsibility for command should be attributed? If there is no US or coalition theater, does that mean that there is indeed no theater, for now? But what about the future? Are concepts exclusively defined in geographical terms sufficient? Or might they enhance the probability that we would remain on the defensive, granting the initiative to the enemy? Those are only samples of the many questions that must asked before we can hope finding proper answers and strategies, not only militarily and across governments but also across societies and actors. We explore here those concerns and work towards providing actionable strategic foresight and warning on the Islamic State war, building upon and looking for best ways to incorporate the more specific War in Syria, the War in Libya and other current and future issues (and related sections). Daily monitoring of the war against the Islamic State across social media: The Caliphate War Sigils. Attacks in Yemen by the Islamic State (up until 22 February 2016) –Platinum members only. Fighting the Islamic State’s Terrorism at Home – Strike back – by H Lavoix, 18 July 2016. Fighting the Islamic State’s Terrorism at Home – The Third Way – by H Lavoix, 27 June 2016. The Islamic State in Libya – When Libyan Tribes Pledge Allegiance to the Khalifah, by H Lavoix, 16 May 2016. The Islamic State in Libya – Force, Fighters and Tribes, by H Lavoix, 25 April 2016. The Islamic State and Terrorist Attacks: License to Kill, by H Lavoix, 4 April 2016. An Updated Guide to the Islamic State Psyops, by H Lavoix, 14 March 2016. Understanding the Islamic State’s System – Wilayat and Wali in Yemen by H Lavoix, 22 February 2016. At War against a Global Islamic State – The Fall into Extreme Sunni-Shi’ite Tensions, by H Lavoix, 1 February 2016. At War against a Global Islamic State – Facing a Strategic Trap in Somalia? by H Lavoix, 14 December 2015. At War against the Islamic State – A Global Theatre of War by H Lavoix, 23 November 2015. At War against the Islamic State – From Syria to the Region by H Lavoix, 2 November 2015. Russia at War with the Islamic State in Syria – Perceptions of Strikes by H Lavoix, 12 October 2015. Understanding the Islamic State’s System – Money, Wealth and Taxes by H Lavoix, 13 July 2015. Understanding the Islamic State’s System – Means of Violence by H Lavoix, 15 June 2015. The Islamic State Recruitment Psyops – From the Balkans to France (update for the Psyops series), by H Lavoix, 12 June 2015. Understanding the Islamic State’s System – The Calif and Legitimacy, by H Lavoix, 25 May 2015. The Islamic State Psyops – Foreign Fighters’ Complexes (2), by H Lavoix, 30 March 2015. The Islamic State Psyops – Attracting Foreign Fighters (1), by H Lavoix, 23 March 2015. Environment, Climate Change, War and State, by JM Valantin, 16 March 2015. Update – War in Libya and its Futures – The Islamic State Advance and Impacts by Jon Mitchell, 9 March 2014. The Islamic State Psyops – The Foreign Fighters’ Threat, by H Lavoix, 2 March 2015. Update – Islamic State Psyops – Dar al-Islam 2 and Dabiq 7, by H Lavoix, 13 February 2015. The Islamic State’s Psyops – Ultimate War by H Lavoix, 9 February 2015. The Islamic State Psyops – Worlds War, by H Lavoix, 19 January 2015. 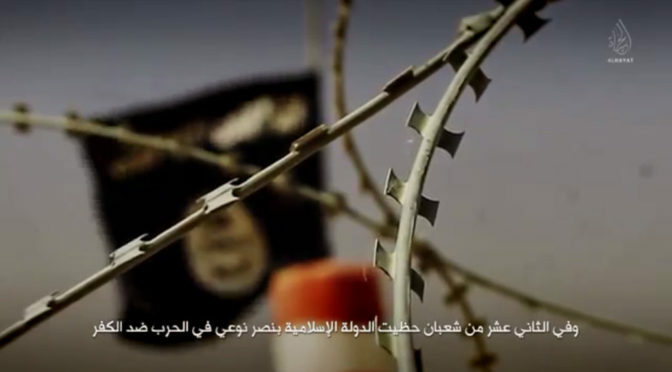 The Islamic State Psyops – The Making of the Crusaders, by H Lavoix, 22 December 2014. Tunisia Museum Attack, Global Jihadi Threat and Public Indifference? (The Red (Team) Analysis Weekly 195) by H Lavoix, 19 March 2015. Denying the Islamism of the Islamic State (The Red (Team) Analysis Weekly 195) by H Lavoix, 19 February 2015. The Islamic State, Puppet Master of Emotions (The Red (Team) Analysis Weekly 190) by H Lavoix, 5 February 2015. Freedom of Speech, the Other, and War (The Red (Team) Analysis Weekly 187) by H Lavoix, 15 January 2015. The Attack on Charlie Hebdo and Denial of War (The Red (Team) Analysis Weekly 186) by H Lavoix, 8 January 2015. Questioning the Content of Military Training for Allies (The Red (Team) Analysis Weekly 180 ) by H Lavoix, 27 Nov 2014. Fighting Wars of Narratives, from AQ to IS, Ukraine and Russia (The Red (Team) Analysis Weekly 178) by H Lavoix, 13 Nov 2014. The Islamic State’s “Ripple”?! (The Red (Team) Analysis Weekly 177) by H Lavoix, 6 Nov 2014. The Caliphate, War in Syria and Beyond (The Red (Team) Analysis Weekly 156) by H Lavoix, 12 June 2014. Working on and with the Islamic State psyops products demands to have access to the material of the psyops. Furthermore good analysis implies that readers should be able to access the sources used for the analysis (or this is an open door to moving from proper analysis to a collection of opinions without any substantive evidence). However psyops products are also sensitive and should not be spread without an analysis explaining it. Trying to conciliate both aims, we have decided to make the source of our analysis available only to members. This primary material must be put into context and read in the framework of the analyses. Most video products are referenced notably by two excellent websites: jihadology.net and pietervanostaeyen. The latter also often references audio messages and their transcripts, as well as updated maps. Others, such as those used for the Foreign Fighters series can be accessed by members (contact us).